1. [Short Title.] 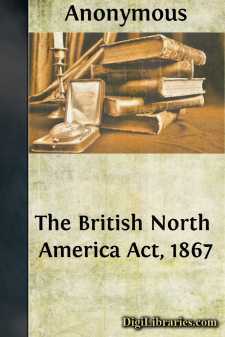 This Act may be cited as The British North America Act, 1867. 2. [Application of Provisions referring to the Queen.] The Provisions of this Act referring to Her Majesty the Queen extend also to the Heirs and Successors of Her Majesty, Kings and Queens of the United Kingdom of Great Britain and Ireland. 3. [Declaration of Union] It shall be lawful for the Queen, by and with the Advice of Her Majesty's Most Honourable Privy Council, to declare by Proclamation that, on and after a Day therein appointed, not being more than Six Months after the passing of this Act, the Provinces of Canada, Nova Scotia, and New Brunswick shall form and be One Dominion under the Name of Canada; and on and after that Day those Three Provinces shall form and be One Dominion under that Name accordingly. 4. [Construction of subsequent Provisions of Act.] The subsequent Provisions of this Act shall, unless it is otherwise expressed or implied, commence and have effect on and after the Union, that is to say, on and after the Day appointed for the Union taking effect in the Queen's Proclamation; and in the same Provisions, unless it is otherwise expressed or implied, the Name Canada shall be taken to mean Canada as constituted under this Act. 5. [Four Provinces.] Canada shall be divided into Four Provinces, named Ontario, Quebec, Nova Scotia, and New Brunswick. 6. [Provinces of Ontario and Quebec.] The Parts of the Province of Canada (as it exists at the passing of this Act) which formerly constituted respectively the Provinces of Upper Canada and Lower Canada shall be deemed to be severed, and shall form two separate Provinces. The Part which formerly constituted the Province of Upper Canada shall constitute the Province of Ontario; and the Part which formerly constituted the Province of Lower Canada shall constitute the Province of Quebec. 7. [Provinces of Nova Scotia and New Brunswick.] The Provinces of Nova Scotia and New Brunswick shall have the same Limits as at the passing of this Act. 8. [Decennial Census.] In the general Census of the Population of Canada which is hereby required to be taken in the Year One thousand eight hundred and seventy-one, and in every Tenth Year thereafter, the respective Populations of the Four Provinces shall be distinguished. 9. [Declaration of Executive Power in the Queen.] The Executive Government and Authority of and over Canada is hereby declared to continue and be vested in the Queen. 10. [Application of Provisions referring to Governor General.] The Provisions of this Act referring to the Governor General extend and apply to the Governor General for the Time being of Canada, or other the Chief Executive Officer or Administrator for the Time being carrying on the Government of Canada on behalf and in the Name of the Queen, by whatever Title he is designated.